Usually little ones under two years old get in the cinema for free. But if your baby enjoys the movie from their own seat, you will be asked to buy a Child ticket. We welcome babies for titles rated U, PG and 12A. But please spare a thought for our other guests – if your baby grows unsettled, step outside for a moment until they’ve calmed down. 2 adults and 2 children (2AD, 2C) or 1 adult and 3 children (1AD, 3C). 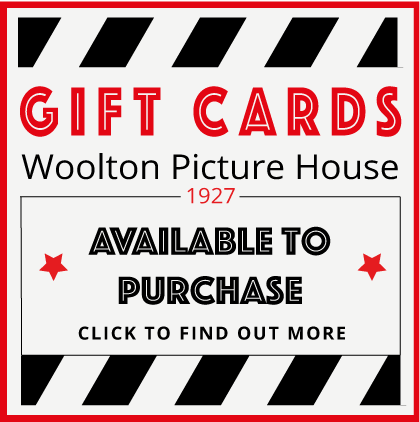 Woolton Picture House have a number of ticket types including adult, child, senior and student. We also have a family ticket available to purchase. Ticket prices will vary depending on the day of the week and time that you visit Woolton Picture House. Woolton Picture House offers reduced tickets for special screenings, which which will be advertised at the Woolton Picture House Box Office. Standard ticket pricing can be seen above. You may purchase your cinema tickets on the day (subject to availability), via telephone on 0151 428 3737 or online for any movie that is screening at Woolton Picture House, as soon as they are on sale via our official website or at the Box Office. Payments at the Box Office can be made via Cash or Debit/Credit Card. Purchasing your tickets online will incur a small Transaction Fee. Tickets purchased online will be issued via the email address provided during check-out. Accepted every Tuesday & Wednesday. You can use the code when purchasing a standard adult ticket, to receive a second adult or child ticket for the same screening. The lowest price ticket will be free. You cannot not use the code for family tickets or for any special screening, including but not limited to Mama & Baby, Christmas Movies, Halloween or Valentines Special Screenings, Discounted movies or for any screening not open to the public. Meerkat Movies ticket can be purchased at the Woolton Picture House Box Office on the day. The CEA Card enables a disabled cinema guest to receive one complimentary adult ticket for someone to go with them when they visit us. A valid CEA Card must be presented. To book your ticket in advance please telephone Woolton Picture House on 0151 428 3737. During the telephone booking process please inform us if you require an adjustment to visit our cinema because of your disability, or inform a member of staff on the day.